Live TV streaming service PlayStation Vue recently added support for Apple's TV app on fourth and fifth-generation Apple TV devices, as well as on iOS. With this addition, PS Vue subscribers can now sync the on-demand movies and TV shows they watch within Sony's app to the TV app, making it easier to jump directly into a PS Vue stream. 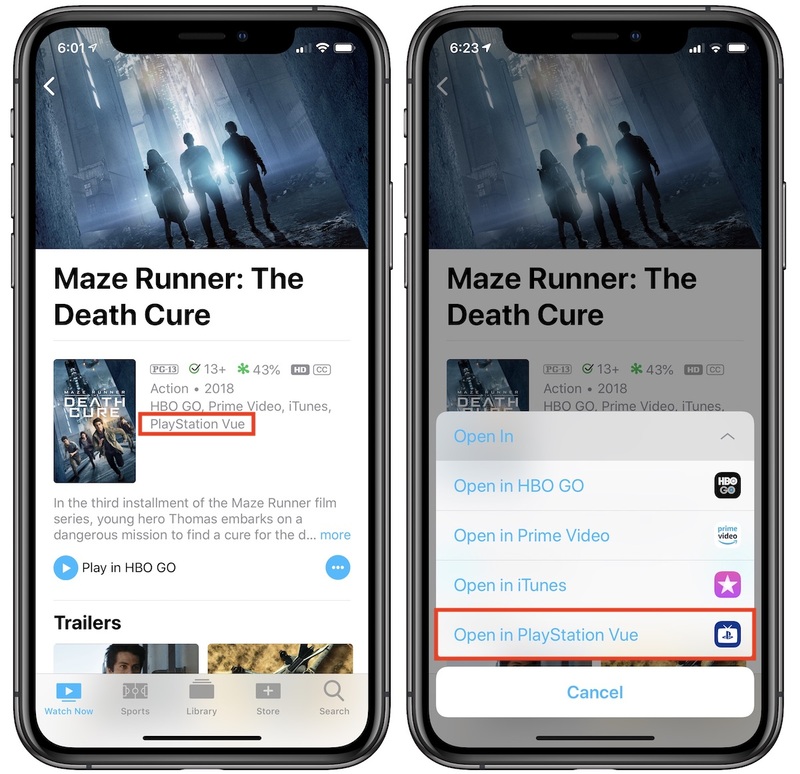 The update is evident when browsing for movies and TV shows in the TV app, with PlayStation Vue now listed as a location to stream content alongside previously supported apps like HBO GO, Prime Video, Showtime, Starz, Hulu, and others. If you subscribe to PS Vue and have the app installed, you can add PS Vue-compatible films and TV series to your Up Next list, and as you watch them in the PS Vue app, Apple's TV app will update and keep track of your progress. As some users on Reddit pointed out, live sports also appear to be supported, so you'll be able to add games to your Up Next list, then jump directly into the game from the TV app to PS Vue and start watching. Apple hasn't noted PS Vue as a supported app yet on its website, but numerous users have reported seeing a splash screen when opening PS Vue on Apple TV, asking them for permission to connect to the TV app. While there are nearly 90 apps supported in the TV app now, including a few live news apps, PS Vue's addition marks one of the first times an over-the-top live TV streaming service has been added. Rivals like DirecTV Now and YouTube TV lack this compatibility. Not that it's directly related, but anyone knows what happened with that Steam Link app for tvOS? So you can jump into live streams from TV app to Hulu With Live TV? I only have on-demand Hulu. Fantastic. It’ll be even better once the tv app allows us to jump into live streams from these services. Anyway I’d hate to subscribe to Vue just to have it shut down so I’m looking at my options and it seems like YT-TV or Hulu Live may be best. That’s the beauty of using these streaming services though. You can easily switch between them because you’re not locked into a contract, no rented equipment, and you can cancel or sign up online at anytime. Sign up for Vue. If they shutdown, then just sign up for one of the rival services in minutes. You cannot. The games only show like FOX, NBC, CBS, etc and not Hulu itself.